A haul of 4 points from Cardiff centre forward Martin Flood, played a major part in a Cardiff victory, after a thoroughly bruising encounter with St Judes of Bournemouth in the Gloucestershire Senior Football Championship semi final in St Mary’s RFC on Sunday. Cardiff, fresh from their victory over St Nicks of Bristol in the League final last week, made the trip over the bridge to meet the youngest team in the Gloucestershire County Championship and make their case for contesting the championship decider. St Judes have made great strides in only their third year, their high point to date, no doubt, claiming the league title last year with a win over St Colmcilles. The stage was then set for a great contest between two evenly matched sides. 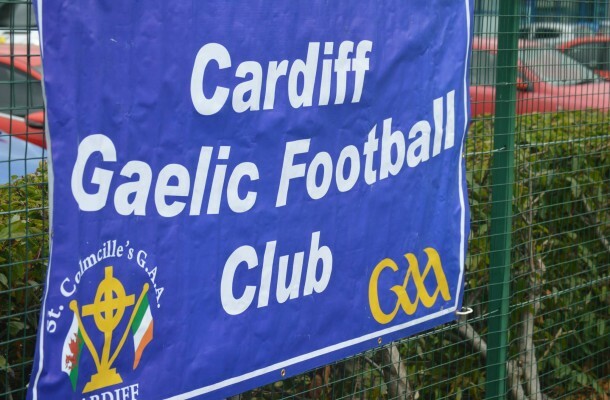 Once again Cardiff were without some big players such as Ciaran Monaghan, David Tack Quinn, Des Foley and Sean Roddy, who sustained a season ending injury in the league final the week previously. Cardiff were also without team manager Eoin Butler, and so, were marshalled pitch side by coach Nevin Riches and assistant Micheal Brannigan. After much rain, the pitch was wetter than an otter’s pocket, although, Cardiff started brightly and got off the mark early with a brace of points from centre forward Martin Flood. Bournemouth eventually found their rhythm and hit back with 3 points of their own to make it known that they were up to the Cardiff challenge. Kevin Smyth and Ollie Harney then began to assert themselves in midfield, getting on more ball and feeding the Cardiff forward line. Some great play from centre back Johnny Murray in dispossessing his man resulted in Marty Dolan delivering a great ball into Amin Dadger who beat his man before finding Cardiff full forward Johnny Hennessy. Marking Johnny is a job not for the faint hearted. The man could drink your milk without opening the fridge. Johnny created some space, fashioned a scoring chance and raised a white flag. Cardiff were working hard in defence with Barry McDonnell at full back keeping things tight and once again Sean Hughes and Paddy McHale working tirelessly throughout. Paddy McHale did well to pick the pocket of a Bournemouth attacker before being taken down with a frontal charge which was about as inconspicuous as a tarantula on angel dust. From the resulting free, Cathal Garvey arrowed a great ball to Ciaran Slevin who carried the ball upfield before, once again, Johnny Hennessy found some space to take the pass and despatch it over the bar. Cardiff goalkeeper Aidan Farrelly picked out captain Dan McCool from a kickout who exchanged passes with Kevin Smyth before earning a free which was pointed by Martin Flood. Great work from Ollie Harney and Kevin Timothy from the resulting kickout enabled Flood to work another scoring chance which he took to put Cardiff 2 points up. Bournemouth responded just before half time to make it 0-5 to 0-4 in favour of Cardiff at the break. Wise words from Nevin Riches and Micheal Brannigan at half time ensured that each St Colmcilles player knew what lay ahead should they wish to book their place in the final. Cardiff started the second half brightly with another point from Martin Flood after great work from Dan McCool, who covered every blade of grass on the Bristol sod, over the course of the afternoon. A flurry of points from Bournemouth levelled the game before Cardiff were dealt a big blow. Cardiff midfielder Kevin Smyth was dragged to the ground and, having returned the favour, was issued with a black card. Kevin was replaced by a new face in the St Colmcilles club. A championship debutant, Johnny Matthews. Johnny can best be described as a blender for which you have lost the lid. He has made a big and very positive impact on the club, despite not being with us all that long. Johnny took his place at corner forward and carried out his job with all the efficiency of a seasoned Gloucestershire campaigner. His Clonduff homestead can puff their chests out with pride! Centre forward Flood moved to midfield with captain Dan McCool operating in a more defensive role in the last few minutes. It was Dan’s unwillingness to be beaten in the tackle which saw him stifle a Bournemouth attack and deliver a pin point pass into the newly introduced Johnny Matthews. Johnny was out in front, won possession and delivered a well timed hand pass to corner forward Amin Dadger, who out paced his man and forced a save from the Bournemouth goalkeeper before Kevin Timothy, following up, drilled the rebound into the empty net. Bournemouth came again but, full back, Barry McDonnell was out in front to win the ball. His grip on the ball so tight that he has varicose veins on his knuckles. The ball was worked up the field with midfielder Ollie Harney curling a great point off the outside of his boot straight over the black spot. Moving into injury time yet another black card, this time for Dan McCool meant the introduction of Micheal Brannigan. Cardiff again won possession at a crucial stage to set up corner forward Kevin Timothy to seal the win with an expertly taken point. Cardiff: Aidan Farrelly, Sean Hughes, Barry McDonnell, Paddy McHale, Marty Dolan, Johnny Murray, Cathal Garvey, Kevin Smyth, Ollie Harney (0-1) Dan McCool, Martin Flood (0-4) Ciaran Slevin, Keving Timothy (1-1) Johnny Hennessy (0-2) Amin Dadger. Subs: Johnny Matthews for Smyth, Micheal Brannigan for McCool. 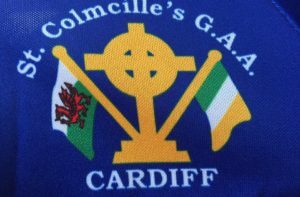 Cardiff will progress to the Championship final in 3 weeks against Western Gaels of Bristol, the sides meeting in the final for the first time since 2010. Again a massive thank you to the management team of Eoin Butler, Nevin Riches and Micheal Brannigan. They say that the weight of responsibility on your shoulders is the best means of keeping ones feet on the ground, well there is certainly no fear of St Colmcilles getting carried away at this point. There are 3 weeks between now and the Championship final. As Abraham Lincoln once said, “Give me six hours to chop down a tree and I will spend the first four sharpening the axe.” Well, we have 3 weeks to sharpen the axe before we swing it for the sweet spot with everything we have. Your support is welcome at the county final.